First Departure: Between 9.00 and 9.30 daily. Last Departure: 20.00 (summer), 19.00 (winter). We are comparing Barcelona Hop-on Hop-off Tour: 1 or 2- Day Ticket Prices from leading ticket suppliers and Try to find you Cheap tickets prices on the market. The first thing to do in any new city is jump aboard the infamous double decker sightseeing bus and start exploring the city. The Hop-On Hop-Off bus runs 2 sightseeing lines all year round, through different parts of the city giving you access to all of the top sites and attractions. Not just for kids and families, a Hop-On Hop-Off bus pass is also ideal for independent travellers, couples on a city break, anyone with walking difficulties or wheelchair users. With a ticket to the Hop-On Hop-Off bus you can ride the entire loop or disembark at any of the marked stops. All bus stops are located nearby Barcelona's top attractions, including La Sagrada Familia, Casa Batllo, the Olympic Port, FC Barcelona Football Stadium, and the National Museum of Art. While onboard you'll be free to use the complimentary headsets and audio guide to learn about the grand buildings and historical features of the city. Teens may prefer to tap into the free Wi-Fi to upload their holiday selfies and panoramic pics from the open-top bus. You can also take advantage of a comprehensive Discount Booklet offering reduced entrance fees to city attractions, freebies, discounts in shops and certain restaurants. West Route/Orange: the full loop takes approximately 2 hours, starting at Placa Catalunya it tours the western side of the city making stops at 18 to 23 locations including the FC Barcelona Stadium, La Pedrera and the World Trade Centre. East Route (Blue): it takes 2 hours for a full tour of the eastern side of Barcelona, you will stop at 10 to 15 locations including the Olympic Port, La Sagrada Familia Cathedral and Casa Batllo. Suited to everyone, including independent travellers, families with young children, and wheelchair users. Your Experience With Barcelona Hop-on Hop-off Tour: 1 or 2- Day Ticket? 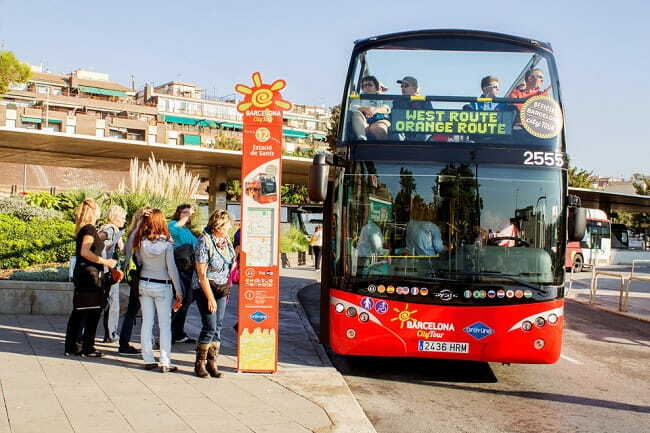 Travel between the top sites of Barcelona on the open-top city sightseeing bus and enjoy the flexibility to Hop-On or Hop-Off at any of the designated stops. Ride the Hop-On Hop-Off Bus as many times as you like during a period of 24 or 48 hours. Travel stress-free around the city. Learn fun facts about Barcelona with the onboard multi-lingual audio guide and navigate the city with a free map. Use the Hop-On Hop-Off Booklet to get discounts at top attractions, shops and restaurant in Barcelona. What Barcelona Hop-on Hop-off Tour: 1 or 2- Day Ticket Includes? Access to any of the Hop-On Hop-Off City Sightseeing Buses for 24, or 48 hours. Free headphones and onboard audio guide, available in 12 to 16 languages including: English, Spanish, Catalan, French, Italian, Portuguese, German, Dutch, Russian, Japanese, Chinese and Hindi. Free City Map and onboard Wi-Fi. West Route (18 Stops) – Casa Batllo – La Pedrera - Avinguda Diagonal - L'illa diagonal – F.C. Barcelona - Estació de Sants - Plaça d'Espanya - Plaça d'Espanya - Caixa Forum – Poble Espanol – National Museum of Catalonian Art – Olympic stadium – Juan Miro Foundations – Miramar Gardens – World Trade Centre – Passeig de Colom – Cathedral – Placa de Catalunya. East Route (15 stops) – Casa Batllo – La Pedrera – Tibidabo – Parc Guell – Hospital – Cathedral – Forum – Nova Mar Bella – Platja del Bogatell - Olympic Port – La Barceloneta – Museum of Catalonian History – Vell Port – Cathedral – Placa de Catalunya. Unbiased comparison of Barcelona's Best Hop-on Hop-off Sightseeing Tours operators(City Gray Line Bus Tours, Turistic Bus Tours) based extensive research, Tripindicator team came up with comprehensive recommendations of Barcelona Sightseeing Bus tour for Family with kids, Couples and Single travelers which helps you choosing Best Barcelona Hop-on Hop-off Sightseeing Tour suitable for your travel. Unbiased comparison of Barcelona's Best City Passes /Discounts Cards(Barcelona Card, Barcelona City Pass, Barcelona iVenture Card, Barcelona Express Card, Barcelona Articket) based extensive research, Tripindicator team came up with comprehensive recommendations of Barcelona city passes for Family with kids, Couples and Single travelers which helps you choosing Best Barcelona City Pass suitable for your travel. Travelers Reviews about Barcelona Hop-on Hop-off Tour: 1 or 2- Day Ticket? The Hop-On Hop-Off city sightseeing bus is highly recommended in customers reviews. The 24 or 48-hour pass has earned a 4.6-star rating from Get Your Guide users. On TripAdvisor it has a 4-star rating and on Viator this tour has 4.5 out of 5-stars. Travellers say that this is a good way to see the city. Some comments have criticised the customer service but the majority of reviews are very positive. Tickets are valid to up to 1 year from purchase and active for 24 or 48 consecutive hours from first use. Cancelation policy can vary depending on tour provider, most are refundable but charges may apply for cancellations made less than 7 days in advance. Children under 4 go free and children aged 4-12 or seniors, 65+, receive discounted tickets. During the summer there are additional stops on the Eastern Route or an additional Green Line. Depending on the season buses will run every 6-15 minutes. There is no service on 25th December or New Year's Day. Board the Hop-On Hop-Off bus at any of the marked stops around the city.